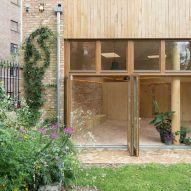 An arched opening in the brick wall of this building in central London leads to a community centre lined internally with glazing that looks out onto garden hidden from the street. 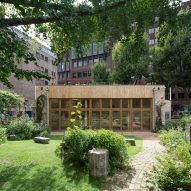 East-London firm Office Sian Architecture + Design designed the building for the Phoenix Garden Trust, which operates a community garden tucked away in the Covent Garden area of London's West End. 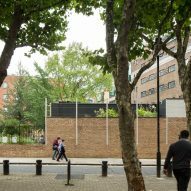 The Phoenix Garden Community Building occupies an area previously covered over with concrete and storage sheds at the corner of the site next to St Giles-in-the-Fields church. 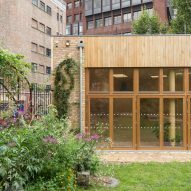 The new structure provides a multipurpose space at the entrance to the garden that accommodates visitors' toilets and a space for hosting events, community parties and school groups. 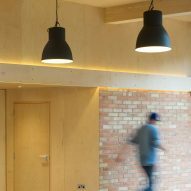 The building responds to the client's request for a beacon capable of catching the attention of passers by, and aims to communicate values such as sustainability and community that are key to the organisation's remit. 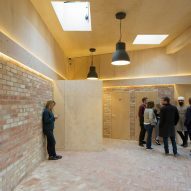 The structure also incorporates materials and details that reference traditional London architecture, including the brick exterior walls and arched doorway. "The design was developed from an early concept of garden walls, as a metaphor for ideas of enclosure, secrecy, and boundaries," said the architects. 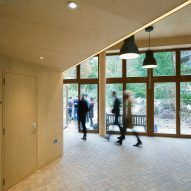 "With a strong emphasis on local context and sustainable design, the building features robust brickwork detailing, super-insulating materials, air-source heat pumps, water harvesting, and green roofs, therefore increasing the level of biodiversity of the area," the studio added. 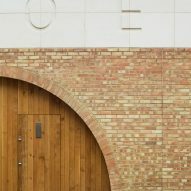 The brick was chosen to match the existing low walls lining the garden. 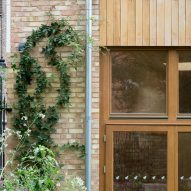 The material lends the building a robust feel that is appropriate for its inner-city setting and role within the garden complex. Above the brick, a limestone cornice inscribed with the name of the garden references the materiality of the nearby church. 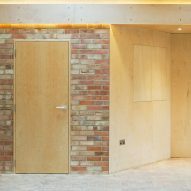 The arched opening in the wall incorporates a doorway that leads through into a courtyard. 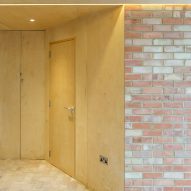 This space is paved with bricks to create a sense of continuity with the main structure. 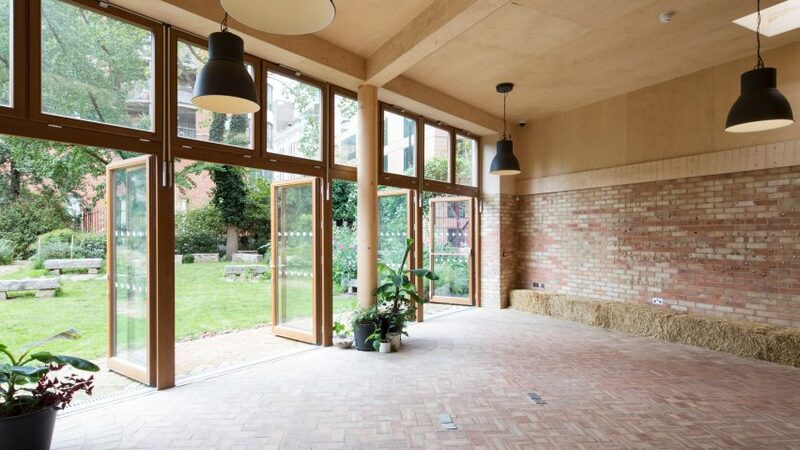 The brick flooring extends from the courtyard and garden pathways into the multipurpose hall, where the bricks are laid in decorative patterns. 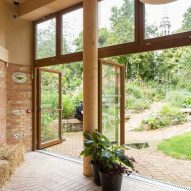 The building's inner elevation comprises a glazed wall incorporating doors that swing open to create a seamless connection between the interior and the garden. 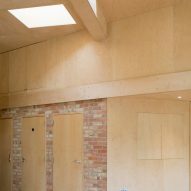 Plywood is used to line the ceiling of the hall, and to form doors and walls that conceal storage and a small kitchen. 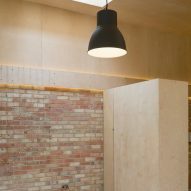 The material complements a pair of thick wooden pillars supporting the roof structure. 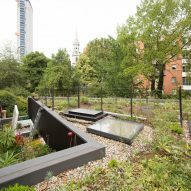 The planted roof adds an extra 90-square-metres of green space to the garden. 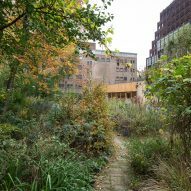 A lower portion of the building is topped with a separate garden that is visible from the street and helps to signal the project's purpose to passers by.